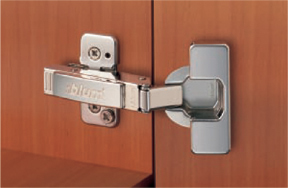 120� opening angle hinge. Has a larger overlay for thicker cabinet sides - 27/32" (21mm) maximum overlay. Includes "spiral-tech" depth adjustment - one and three quarters revolutions of the screw creates 3/16" (5mm) of adjustment without loosening and retightening a fixing screw. Small flange around perimeter of the cup gives added strength and the bottom is closed so you don't see the door core material. INSERTA model provides tool-free door to cabinet assembly and removal. Nickel plated finish.